If you expected that Kubuntu 12.04 would follow the KDE's traditional blue colour scheme, then you will be disappointed. This was surprise #1 for me. You can see it right after the start of booting process. Even the splash screen of Kubuntu 12.04 is... grey! There are different shades of grey, but this is still grey. Not blue. It is funny that usually-blue-themed KDE became grey in Kubuntu 12.04, while usually-grey-themed XFCE follows the blue-and-grey pattern in Xubuntu for a few releases now. Kubuntu 12.04 has the same boot mechanism as the previous version 11.10. It copies Ubuntu's behaviour, although with a slightly changed interface. System boots automatically for some time, finally leaving you with selection between "Try Kubuntu" and "Install Kubuntu”. 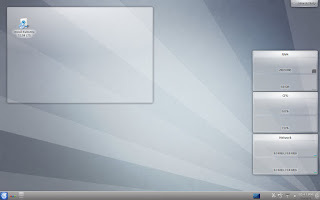 This screen has similar choice, including set of languages, to the ones in Ubuntu and Xubuntu 12.04, although design of the window is radically different. My choice, obviously, was the "Try Kubuntu" option. Once selection was made, it took the system some more time to get me to the desktop screen. I have noted in my Ubuntu 12.04 review that the system took more time to boot up to a window with Try/Install options than to make final preparations. I would say that it was 80-20 proportion. Kubuntu's proportions are 60-40, so total waiting time for Kubuntu Live boot is more than for Ubuntu. I can say this is surprise #2. Once booted, I found myself in KDE 4.8.2 running on top of Linux kernel 3.2.0-23, as the other 12.04 systems. Freshly booted system took about 280 Mb of memory, which is quite a lot, but that could be expected from KDE-based distribution. This is about 40 Mb more, than in version 11.10, but still 40 Mb less than Unity-based Ubuntu. It is worth mentioning that Kubuntu 12.04 uses the kernel with pae requirement, similar to Ubuntu 12.04. So, if your processor does not have pae support, your choice should be either Xubuntu, or network installation disk with further selection of KDE environment. It should not be a surprise for you any more if I tell you that the default wallpaper in Kubuntu 12.04 is in grey colour. However, there are two more surprises here. Suprise #3 is that the default wallpaper image is... ugly! I can't find a better word for it. KDE is famous for its eye-candies and nice user experience. This experience simply cannot start with an image like this: straight segments of grey shades beaming from the bottom-right corner. And, if you want to change the wallpaper, then there is suprise #4: there are no other wallpapers in the default distribution! All the wallpapers are to be downloaded separately, either the "default wallpapers" package, or additional wallpapers from Internet resources. There is nothing on the default desktop, apart from a single folder with "Install Kubuntu" shortcut in it. First of all, I added my favourite widgets there: CPU, memory and network monitor. All of them were available right out of the box. There is a standard panel at the bottom of the screen in Kubuntu 12.04 Precise Pangolin. It has all the usual elements of KDE distribution. If you want to get a list, I'd ask you to check my Kubuntu 11.10 review. Surprise #5 was waiting for me on the panel. The titles of minimised windows are barely visible there. They are in light-grey fonts on the light-grey panel. KDE is famous for its desktop effects. I have already mentioned this above. So, I went to the system configuration and tried to activate these effects. Result? Surprise #6! Result was negative! System listed a couple of dozen effects, which could not be activated. As a result, I was left with a very simple desktop. There even were no shadows under the windows and menus! The fix was around the corner. Switching from OpenGL to XRender helped a little. Only few effects were left inactive. But I believe that the previous version of Kubuntu was able to work with OpenGL normally. Why did it change? I had no issues with network connection in Kubuntu 12.04. It automatically found and configured my wireless network card Intel 3945 ABG. The Network Management utility automatically listed available wireless networks when I clicked the icon in notification area. All I had to do was to type in my security code and click "Connect". Keyboard layouts are configured in the same place in the System Settings of Kubuntu 12.04: Input devices. You will find the KDE standard interface there. Additional layouts, keyboard hotkeys and panel indicator can be configured in the same place. It took me less than a minute to replace the default English US layouts with combination of English UK + Russian, Ctrl-Shift hotkey and the flag indicator. Here I'd like to mention the surprise #7. Again, it is in the user interface design area: the flag on the panel is visibly smaller than other elements. Why? Kubuntu, as usual, comes packed with some applications. Let's see what is inside. Rekonq is the only browser in Kubuntu 12.04 Precise Pangolin. I used it for some time. I actually drafted this blog post using Rekonq. Here I'd like to mention couple of surprises. Surprise #8 is that Rekonq recommends you to install Flash plugin at the start. If you do so, you still... have no flash! So, the installation basically does nothing good for you. Surprise #9 is that Rekonq never crashed in my Live run! This is a good surprise! I remember issues with Rekonq stability in Kubuntu 11.10. They're now gone. Rekonq is now a mature browser, which you can use if you don't need advanced features of Firefox or Chrome. Of course, Firefox installer is also available in Kubuntu 12.04. Other than these two items, the Internet section of the menu contains BlueDevil bluetooth manager, Kopete, KTorrent, Akgregator, KMail, KPPP and Quassel IRC. As you see, all of them are KDE-centric applications. LibreOffice applications are in the core of the Office section of the Kubuntu 12.04 menu. This is not full set of LO applications: Base and Math are not in the distribution. KPatience is the only representative in the Games section of Kubuntu 12.04. Okular, Gwenview, KSnapshot and LibreOffice Draw are listed in the Graphics section of the menu. Funny enough, LibreOffice Draw is not listed in the export options of KSnapshot, it is only available through "More applications". That's not what I would call good integration of components. Multimedia utilities have DragonPlayer, Amarok, KMix and K3B burning tool. Kate, Klipper, KNotes and some other useful tools are in the Utilities section of Kubuntu 12.04 menu. The System part of the menu includes the same K3B, plus Muon Software Centre, Muon Update manager, Muon Package Manager, Konsole, Dolphin browser, Akonadi configuration tool and some other utilities. As you can see, there are enough tools in the Kubuntu 12.04 to get you started. The necessary office, graphical, Internet and multimedia tools are available. But, of course, you're likely to require more. That's why you're more than likely to need Muon. Muon came to Kubuntu as of 11.10, and now fully owns the package management of this distribution. Kubuntu 12.04 comes with Main and Restricted repositories activated by default. At the same time, Universe and Multiverse repositories require additional manual activation. Interestingly enough, Kubuntu 12.04 LTS default settings show upgrade available to any newer release. That was not the case for Kubuntu 10.04 LTS, which allowed only LTS version upgrade by default. Just out of interest, I asked Muon Update manager to check if there was something for me. Kubuntu 12.04 was released exactly a week before I drafted this post, and there were some updates already: 8 security updates and many more system updates. Their total was about 40 Mb. Not that bad. Of course, the installation of updates was not in the plan of my Live run, so I closed Muon Update manager without installing anything. Muon Software Centre is the tool which you need to use to install the software. It looks fine, intact with other Kubuntu applications. Unfortunately, I found surprise #10 here, which would definitely stop me from using MSC. Search... does not work! I could navigate through the MSC menu to the Chromium browser. But search gave me nothing! It makes this tool useless. I know, this maybe an issue of Live run. But how could I (or any average newbie) ensure that all my applications are in the repositories, if simple search does not work? How can I trust the system at all after this? Mounting of partition from my external network drive was an easy task in Kubuntu 12.04. Dolphin lists Microsoft Windows Network Drive as one of the options in Add Network Folder tool. Connection took me only a few seconds, and then I was able to browse folders and files on remote device. Neither DragonPlayer, nor Amarok were able to play MP3 files in Kubuntu 12.04 Live run. Even the Dolphin's built-in "preview" player failed. All of them recommended to search for the required plugin, but then the search window disappeared without any visible feedback. I should name it surprise #11, even though I was not prepared for this by similar behaviour of Ubuntu 12.04. Unable to create io-slave: klauncher said: Error loading 'apturl %u'. At this moment in time (and it was far beyond midnight), I thought: “Enough”. That was a time to stop my experiments with Kubuntu 12.04. Next day was a test for the persistence option I activated in Unebootin. Kubuntu 12.04 LTS kept my changed wallpapers, network connection, attached network drive. This is really useful feature, if you want to use your USB stick for pocket-size distribution. What do I think about Kubuntu 12.04 Precise Pangolin? The system was relatively fast on my laptop with dual core Centrino 1.7 GHz and 1Gb of memory. I found no significant delays or unexpected waiting time. The system was solid. I faced no crashes during my Live run. Both these points say that Kubuntu 12.04 Precise Pangolin is good enough for Long-term support version. But, on the other hand, I found 13 suprises in this operating system during the Live run. And only two of them are nice: maturity of Rekonq and working persistence. All the other are more or less unexpected errors or defects. I think that the design team of Kubuntu was on maternity paternity long-term leave when 12.04 was prepared. There are too many obvious omissions to think about Kubuntu as an eye-candy rich and polished distribution. Should the long-term support version be like this? Maybe you want to try Kubuntu 12.04 yourself? Then, order your own CD of this distribution, or many others, from Buy Linux CDs site! Your disk will be delivered right into your mailbox. You can read this article in Serbo-Croatian language. Thanks to Jovana Mulitinovich for translation. I guess HALF of these bugs were caused by the fact that, during install, you had no internet connection. Then, the package manager didn't have access to internet repositories. And then this are disabled. I always do the same: go to the package manager (this time, muon), and enable some repo (like canonical partners), and do a reload of the packages. And then half of your bugs are gone. Obviously, this is a STUPID Bug, because it is EASY AS HELL to test this. The solution ? Maybe reload the packages, at least ONE time, if the internet goes up for the system (i say at least one time, not always, of course). In the end, it is Kubuntu, with all its known bugs. 1) it was a review of Live run of Kubuntu 12.04. 2) Internet connection was up and running from the very beginning. You then probably missed a major point: for being able to search for packages in MUON, it'll have to update the package list at least once, which it can't do in live mode as the relevant portions of the file system are write protected in live mode. The same goes for Flash installation. Let me disagree with you here. Both Muon and Flash installation worked fine in Live run of Kubuntu 11.10. Why the change in 12.04? Suprise #1: KDE made some changes in the 4.8 version with the default wallpaper and login (KDM) theme. It seems like Kubuntu simply tried to follow these changes and adjusted boot (plymouth/GRUB) theme to match new KDE colors. I personally like the effort to stay consistent and I like the new style. It's the question of personal preferences. You like the change, I don't. Interestingly how the use of a word like a "Suprise" in a review allows for a great amount of subjectivity and freedom in writing. Yes, you're right. And as long as this is my own blog, I can express my own view on things, can't I? If the article writer is fully aware that Canonical has publicly announced it's intentions to drop Kubuntu distribution entirely, then these issues experienced should not come as a surprise. Why would the company invest any good effort on a distribution it really wants to go away? I am fulyl aware about Kubuntu vs Canonical deal. Still, why release product which is not good enough to the previous standards? I was using Kubuntu 10.04 and 10.10 for long time. Kubuntu 11.10 was less addracting. Kubuntu 12.04 is even worse. Declining distro or declining quality standard? I've got the same OpenGL/XRender issue on my system. If you change to XRender and then change back to OpenGL, OpenGL will work :/ Wierd but works. About the Muon search issue. You have to wait for it to (re)create the search index. It worked for me after that. Thanks for the OpenGL/XRender hint. Xubuntu 12.04 includes some additional wallpapers. They maybe not OK for somebody's taste. But they're OK for me. And at least, they exist in distribution. Tried to install Kubuntu 4 times (I've been using Linux for 10 years). The first time the installer crashed somewhere around the "nearly finished" notification. Twice the installer crashed trying to download updates. The fourth time it crashed at the end of the update process. On the fifth time it went through as expected. Network speeds were right down at a 10th of what I normally get. The NVIDIA driver wouldn't work. Nouveau couldn't make any effects work. The package manager is awful. It still sprays the shutdown screen with dmesg info when it shoudn't. The onscreen fonts look dreadful and no amount of tweaking seems to make them better. All in all I thought it was a terrible release. Think I'll stick to slackware - it's lovely and easy by comparison. surprise #11 - This is true in Live session. After install everything is OK.
#7 - making a distro is not just getting packages together on the same ISO image. It is also polishing them to work nicely together, both on the programming and interface levels. And "upstream issue" is not an excuse here, provided Kubuntu has some good userbase and number of [community] developers/testers. #11 - I know about this, but still Live version is a presentation which "sells" distribution to potential user. If smth does not work in Live, who can be sure it works in real system? Installation is a big step of commitment, which not everyone is prepared to without proper understanding of consequences. #12 - Flash installation worked fine in 11.10 and previous versions, see my comment above. Most of what is reviewed here, as already pointed by other comments, is false or not accurate. Let´s be honest, it is unreasonable to expect a system to be so simple that it can be managed with no training or previous experience, much less when we are talking about a DE as powerful and customizable as Kubuntu. Most surprises described here wouldn´t be if the reviewer had some understanding of how KDE and Ubuntu work. I can also tell the reviewer (even when claiming previous experience with it) knows little about Kubuntu as a distro. Kubuntu always strives to provide a pure KDE experience, which applies to the application catalog (which probably come Kubuntu 12.10 will be exclussively KDE based when Telepathy and Calligra become defaults), but also to aesthetics. 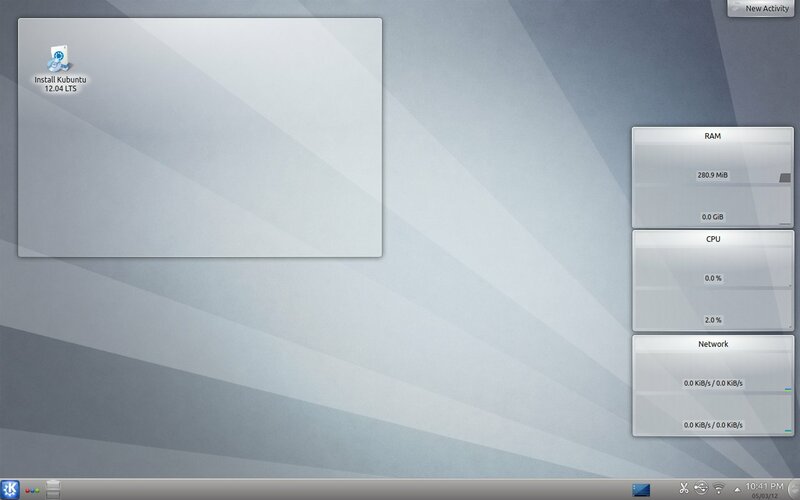 Kubuntu 12.04 therefore aligns with the new default wallpaper that made its debut with KDE SD 4.8. Similarly, it is easy to realize that the new splash screen simply combines the different tones of grey that are part of that default wallpaper. Kubuntu and KDE are far from being perfect, but this review doesn´t really point the real problems... In fact, reviewing a Live distro using criteria that applies to a full installation is a bit of nonsense to begin with. Is the size of the keyboard layout indicator something requiring strong knowledge of KDE and Kubuntu? It's a KDE/Kubuntu/whoever else design issue, not user's or reviewer's! Failing of Flash installation - does it require some specific user trainign? If yes, it should be provided within the distribution, not on the "guess how it works" level! Most of the issues listed here are those which were OK in previous releases of Kubuntu, but are broken in 12.04. Disregarding the Live or installed system run, they are different. Don't be fanboy'ish. Accept there are some issues to be fixed. Kubuntu esta usando la configuracion de KDE, me refiero al los colores y el wallpaper. Thanks for the translation. I think I have answered this point already. Man, stop judging live distros like you hade to use them everyday. Just try to install them on a virtual machine so you could also evaluate the install process and verify the divers/flash/software managers in an environment where it makes more sense. There are plenty of resources where people write about virtual machine installation and so on. Let me be different. Let me be me. I don't make you read this. It doesn't even need to be a virtual machine, why not using a USB stick for installing it (physically) thereon? Decline installation of GRUB and use sudo update grub of your base installation to catch the new installation. ??? "1) I am not always sure that installation will go correctly and other partitions remain untouched." This point should be fixed by using a "safe" partition as outlined above. Popints 2 to 4 can be assured just as fine using a "permanent" install on USB sticks. Furthermore, the vast majority of people is interested on how a system will run when it is actually installed. Thei si the user experience they want to get info about. Swapping HDD is not an issue with the above method. So, yes the question remains: Why do you still review Live systems? Or, put in another way, why do you complain about issues that are most likely non-issues in a "proper" install. By the way, you need to update the package database at least once before MUON can tell you anything. If you have attemtped to update it without internet connection before, just update it with internet connection (as this is what is useful). I had an experience when "safe" partition did not help. Pardus Kurumsal crashed all the partitions on my HDD! 1) I stick to my own rules. I impose them on myself, and I will change or keep them whenever I like. 2) If you or anybody else does not like the reading - do not read it. This is a free world, and "Close" button is somewhere on the top of the window. 3) If you keep giving me advises, I will repeat the phrase from here. 1) I would appreciate if you took the above and below as an invitation to think your own rules over (no patronizing, no commandment). 2) I am sorry that I can't judge a review BEFORE having read it. But I promise to never again read any of your reviews. I can't guarantee anything about "how installer works", that's why I don't want to take the risk. I can assure you, that there were many people trying to convince me to change the rules. It was the reason why I wrote the "Why do I..." post linked above. I am sticking to my rules, you're free to introduce yours in your own life. I will delete all the further comments about this. One thing that frustrates me is the Firefox integration or the lack of it. I find the speed is better than the previous Kubuntu. Also i think the default wallpaper is ugly. Why not keep the previous one, which was a very good one in my opinion? All and all not a bad distro. How should i be mean? (I am the one of the comment Anonymous 9 May 2012 09:15). Did I say anything incovenient or rude? Or mean is someone with thoughts different from yours? I'm just suggesting that I would feel these reviews much more useful to end-users for a number of reasons. I call it constructive critics, and this is supporting too. Then feel free to make something out of it or ignore it. If I have to blame someone, that is Lxer, that reports news from here which make me a lot curious but rarely satisfy my expectations. Here I'm just giving sincere opinions. Mean is something else. Your particular message is not that mean, even though I can always respond with good Russian saying: don't tell me what to do, and I won't tell you where to go to. I very much appreciate your sincere interest in my reviews. There is nothing on LXer to blame. I and then always provide my name under my posts, so you know when to click or not to click. Decision is yours, not mine. If you feel curious about the text, then read it. Another point here is that when I write a review which basically says "the distro is well-polished and deserves attention", nobody reads and comments. Except for PCLOS community, which is very responsive always. (kudos) At the same time, if I spot issues in the distro and announce them in the post, people start blaming me in all the imaginable sins. This sounds fanboyish from their side, doesn't it? What is better: a friend which tells you where your weak points are, or an enemy which lies that everything is perfect? The problem is not that I (another ananymous) would not value critique, but if the testing method is as bogus as it is (i.e. not assessing a proper install, which is what people out there do), your "critique" is pretty useless. If most of the complaints are non-issues in an installed system, then what is the take home message from your review(s) here? I had Live systems running perfect and installed they could not start an X-server. I had live systems that would simply not connect to the internet in Live mode and picked up WLAN without issues in a proper install. Your chances are high that when it runs in Live mode, It'll likely run installed. But from my experience, vice versa is not the same, i.e. If is does not work in Live mode, then your chances are still good that it will run installed. This is due to the fact that depending on the Live method used, a Live system may allow for system modifications or not. Please try to convince me that layout indicator flag will increase in size in the installed version, or that the default wallpaper and splash screen become blue. I won't buy it. Live version is the shopping window, where potential user buys or does not buy the system. It should be polished and shiny. Buggy Live versions means DNA code errors in developers blood, whatever is in the full installation. Every single detail counts. You take on suit on the job interview, even if you know that the company does not have white collar policy in the daily business. That's because you want to make an impression. Why do you allow bugs in the first meeting with potential user? Again, there's plenty other blogs describing behaviour of installed (HDD or VM) systems. I can personally recommend Dedoimedo, ITLure, Prashanth, Linuxaria. Let me be me. Discussion about Live/Installed is closed. All further comments about this will be deleted as spam. I stopped reading after "waaah, I dont like the grey instaed of blue' and "waaaaah, i dont like the wallpaper". I hate ALL defaults: wallpapers, themese, font sizes, you name it, on every desktop ive ever installed (and still think they are good distros) so I didnt feel like wasting more time. Maybe the rest is better but whining about default wallpapers is.. well, whiny. If you hate all the defaults etc, I wonder how you descended to the commenting here... Oh, the greatest Anonymous! Yet another proof to my point. Not always, but in most cases. Well I'd recommend that you run it as an install. ;) It runs much more stable. I maybe try, if I have spare partition. For example if Xubuntu 11.10 fails to upgrade (which I doubt, due to number of positive comments in this area). Updated to Precise yesterday on my Thinkpad T520. All system settings were persisted through the upgrade. Programs start up noticeably faster and uses approx. 30% less memory after start up. I didn't do a live test before installing and I gotta say the full experience is quite good so far. They fixed the lag spike I had during notifications and quite a lot's of bug I had in 11.10. One thing that I still don't understand is why people worry so much about the wallpaper when most people will change it soon after installation. None the less, this was still a nice read. I suppose the proper bugfixing is the must for the LTS version. Although, have you faced the same issues in installed version as I mentioned above? If not all, which of those still exist? I've had previous awful experiences with PCLinux KDE and Mandriva too. I've heard lots of negative comments about Kubuntu during the last few years so my expectations were something between grey and black. Install was simply and easy, some connection problems with USB-modem, however it wasn't hard job to install what i really needed. I used live-cd (~700 MB) so i guess that's the reason why some packages were missing in first desktop visit. Perhaps biggest surprise was that missing IcedTea plugin. And flash plugin too. There were hardly any plugins in Firefox while in Linux Mint there were near 10 ready waiting for you. But as you all know Mint is live-DVD nowadays. Thanks for the review. Unfortunately, my Linux experience has been full of "surprises" too. I have noticed that sometimes a clean install (compared to an update or live CD) solves *some* or *most* of the surprises, but not all of them. Just now I am typing this on a Ubuntu 12.04 machine, with kubuntu-desktop and xubuntu-desktop installed afterwards. That brings a lot of duplicate functionality, but ensures that I'm not stuck with half-assed apps. I'm currently using KDE, but I had to learn not to move the panel to the sides (icons get stuck above/below each other, or in an incorrect rotation), and avoid tinkering too much with desktop widgets and activities (they sometimes crash). Changing mouse cursor themes causes some misbehavior too (wrong arrows when resizing, mixed themes, etc.). If could make a wish, I would ask for a distribution without "surprises". But it needs to be well known and well supported too, as I know the pain of running a little-known distro. I wonder why you mention Debian as distro "without surprises". Please make the same test with their Gnome live CD as you did with Kubuntu here. Still it shows that people (you and me included) usually make recommendations based on real install performance and not live CD (dis)functionality. Unfortunately, I have not tried Debian GNOME in Live mode. I only have it installed on my laptop. But I tried Debian KDE, XFCE and even LXDE. They don't have that many surprises. Maybe LXDE one only, but these are more LXDE-relevant, not Debian. Good review, all valid points. Let's hope distro makers read the article and fix the bugs in the next release. Otherwise, I am happy you like the latest Kubuntu release. After two days studying this Kubuntu i found it actually much decent than Ubuntu Unity. Of course default wallpapers etc are "ugly" but it doesn't take long time to use package manager to download tons of wallpapers there. This is just my second try to Kubuntu and i want at least one KDE-partition on my pc. I tried Mageia 2 last week and there was actually very big one disappointment: no internet connection with Huawei E353 USB-modem. Then there is also that everlasting Grub problem (older Grub than Grub 2). With no grub problems and no Huawei USB-modem problems was one good reason to give Kubuntu a try. At least you can customize your desktop, but how much can you customize Mint Cinnamon and especially Ubuntu Unity? So i keep testing this KDE-distro and wait for Linux Mint 13 KDE. Yes, the ability to test hardware and potential software problems is what Live Linux is for. Have you bothered yourself to read other comments to this blog post before writing your own? I suggest to any who is a KDE fan a needs stability and great hardware compatibility, to give a try to the just released Mint 13 Maya KDE RC... it's absolutely an awsome system... no surprises at all for me! Do you want to write your own review of this distribution? Will be happy to publish it here as a guest post! Have you filed this as a bugreport? All in all you're saying that the system is ugly... About 80% of your negative surprises are perfectly suitable for me, and most of them are positive. I don' say that your opinion is not important. I wrote my opinion here, feel free to express yours as well. If you want to write your own review, welcome. I'll be happy to publish! While all that your review says is valid, I spotted another glitch. When the computer hibernates, and later, you boot it up, it stops accepthing ethernet connections. It's still refusing to acknowledge the fact that the ethernet is plugged in. Any suggestions?? As a professional graphic artist I appreciate the grey theme. It's a neutral non distracting background. The stripes at least provide some visual stimulation. I suppose I can understand how this isn't appealing to most people. However, I think on a different level it allows itself to remain in the background. Encouraging you to customize the desktop for yourself. That seems to be a prevalent theme with Kubuntu. Repeatedly they ask you to play and customize. I think it's a conscience and deliberate decision. The only way I can get Kubuntu 12.04 LTS to install properly is to disconnect my ethernet cable so there is no internet. That said, on identical hardware the OS installed so differently that I have different bugs to correct on each of three machines. I have no idea how this is even possible. The hardware is identical right down to individual chipsets. One one computer I have no problem with saving settings and logging out. On another Kubuntu refuses to save user settings, such as screen resolution, taskbar widgets, and even deactivated desktop effects (which eat up half the cpu cycles--who thought this was a good idea anyway?) Unfortunately it seems that Kubuntu is gradually becoming more like Windows. What choice will there be in 10 years when Microsoft is in Chapter 11 and Kubuntu and other distros are just as bad as Windows? Katia, Kubuntu is not the only KDE-based distribution, even on Ubuntu's foundation. Try Mint KDE, Mageia KDE, OpenSuSE KDE, Debian KDE etc. There are even some KDE-centric distributions like Chakra.